The stats used in this post come from a database of nearly 100 statistical categories that I’m collecting this season for the SPFL. Access to updated stats will only be made available to people who contribute a one-time fee of £15. If you are interested, read more here. The Conversion Rate stat in football is a very straight forward, easily digestible stat. What percentage of a player or team’s shots beat the keeper? Even in isolation you can make some generalized predictions about whether a players scoring rate is due to increase or decrease. I think you can make even better conclusions if you examine Conversion Rates in relation to Expected Conversion Rates. Most football fans are getting used to the concept of Expected Goals as a tool of measuring chances created by players & teams. What an Expected Conversion Rate does is simply replace the actual goals in a Conversion Rate equation & substitutes it with Expected Goals. So, simply divide xG by the total shots taken. A key adjustment to make here is to subtract blocked shots from the total shots. If you want to evaluate a player using this stat it’s best to only include shots that actually end up going towards goal. Below you’ll find a graph showing the Fenwick Adjusted Conversion Rates (only using unblocked shots) in relation to players’ Expected Conversion Rates. All players who have taken at least five shots this season are included. You can see that most players are clustered around the league averages of 0.138 (Expected Conversion Rate) & 0.139 (FenAdj ConvRate). Then players become outliers in multiple directions. Some in a bad way like Kenny Miller & Simon Murray who are both not scoring at a rate that comes close to their xCR. Players like Rory McKenzie & Graham Cummins still haven’t scored this season despite having some of the highest Expected Conversion Rates in the league. Both players have seven shots & given the kinds of shots they have taken, both should have scored on 27-28% of them. That basically translates to two goals instead of zero being scored. Then you see players like Graham Dorrans & to lesser extents David Wotherspoon & Murray Davidson who are scoring on a high rate of their shots in relation to the kinds of shots they are taking. Dorrans has scored on 40% of his unblocked shots this season when his Expected Conversion Rate suggests he should have only scored on 8% of his shots. Dorrans is currently on pace to score about nine goals this season, but his Expected Goals suggest he is on pace to score closer to 2.5 goals. Of course, Dorrans may end up having a career season in which he consistently finishes at a higher rate that the data suggests or he will be due for long stretches of not-scoring as his shot rates normalize. 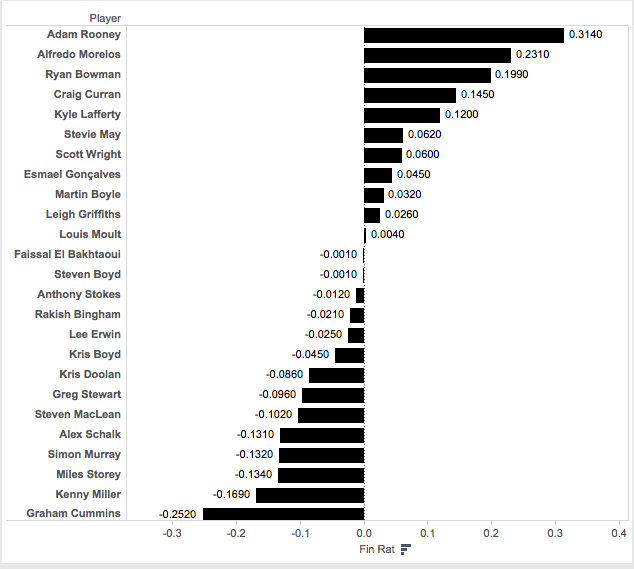 You can also see that there is a real divide between the players whose Expected Conversion Rates are above 0.20 & those who are below that rate. The following 12 players all are getting high quality shots that suggests they should be scoring on at least 20% of those shots. You can see that some of them are matching or exceeding their xCR (Callachan, O’Halloran [oh yeah, that’s beyond unsustainable], Erskine, & Morelos) while a defender like Andrew Considine is likely targets on set pieces & isn’t really putting away the chances that have been created for him. When first looking at these two numbers together, it made sense to subtract the two to get a sense of which players are doing the best jobs of finishing off the chances that they are getting. We get players Finishing Ratings by subtracting their xCR from their Fenwick Adjusted Conversion Rates (FenAdjCR – xCR). Again we are excluding blocked shots to get a sense of which players have been the best & worst finishers this season. Given that forwards are paid to finish, we will only focus on them & in this case, we will only include forwards who have taken five or more shots this season. 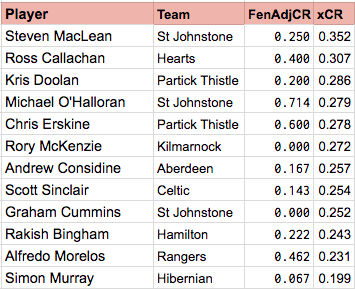 The best finishers in relation to their Expected Conversion Rates have been Adam Rooney, Alfredo Morelos, Craig Curran (?) & Kyle Lafferty (????). Curran & Lafferty have only scored two goals a piece this season. How could anyone claim they have been good finishers?? Remember, this is based on their Expected Conversion Rates based on the shots that each player takes. Lafferty’s shot selection has been poor this season & he plays on a team that truly struggles to generate quality scoring chances. In turn, his Expected Conversion Rates suggests he should have scored on 6% of his shots, while he has actually scored on 18% of his unblocked shots. So….it’s nice that his finishing has actually been pretty good, but given his inability to get quality chances this season it means he still only has scored two goals for a team in dire need of goals. To get a better understanding of how a player’s Finishing Rating is impacting his actual goals scored this season, it makes sense to look at it in relation to each forward’s Goals Above Average (GAA) number. This stat is explained more in detail here, but it basically takes a forward’s goals per 90 & subtracts it from the league average goals per 90 for forwards over the past three full seasons (0.342). My theory is that most players will continue to hover around the blob in the middle, scoring at a rate slightly higher or lower than their Expected Conversion Rates. 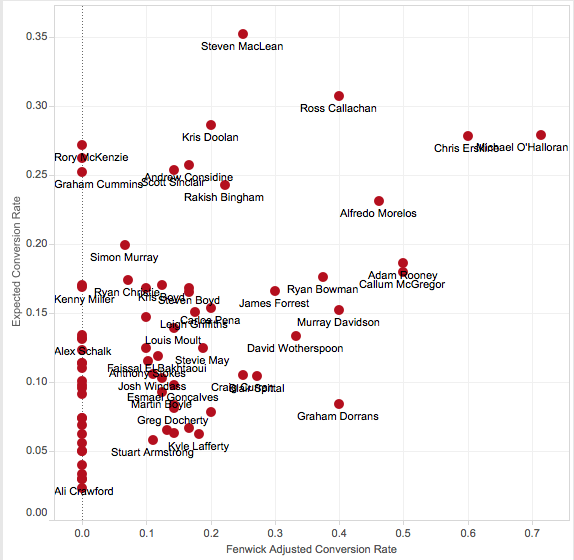 So players like Steve May & Leigh Griffiths have positive Finishing Ratings (May’s is +0.06, while Griffith’s is +0.03). Both forwards have above average scoring rates this season with Griffith’s having the third highest Goals Above Average in the league. It’s safe to assume that he will continue scoring at a high rate (given his track record & given the data). The same with Louis Moult, who has the fourth highest GAA & his Finishing Rating is even at 0.00. His scoring rates match up with his Expected Conversion Rates. His goals per 90 is 0.57 & that high rate should continue moving forward. Now let’s look at the below average forwards in the league this season whose Finishing Ratings suggest that title may last. 34-year old Kris Boyd has a Goals Above Average of -0.10 & has scored one goal in 378 minutes this season (0.24 goals per 90). Now even though he has been contributing in other ways on the pitch for Killie, we are only looking at goal scoring here. His Finishing Rating is -0.045, so he is scoring slightly less than his Expected Conversion Rate suggests. His xCR is 0.170 while his actual Fenwick Adjusted Conversion Rate is 0.125. Given those numbers Boyd should have 1.7 goals this season & he only has one. The margin isn’t that great but if he can find his form he’ll slide up closer to Steven MacLean in the graph & would be producing at a slightly above average rate. But at 34, he is a long shot to find that goal scoring form. Then there’s someone like Faissal El Bakhtaoui, who has a reputation for taking a lot of shots from outside the box. In fact, 68% of his shots have come from outside the penalty area, which is second only to Scott Wright on this list of forwards. His production is slightly below average (GAA of -0.03) & his Finishing Rating is basically zero (-0.001). El Bakhtaoui has scored two goals this season (0.30 goals per 90) & that may be all he’s good for moving forward. Given that both of his goals came from ‘inside the box’ his rate may actually decrease if he continues to rely on shots from outside the penalty box. 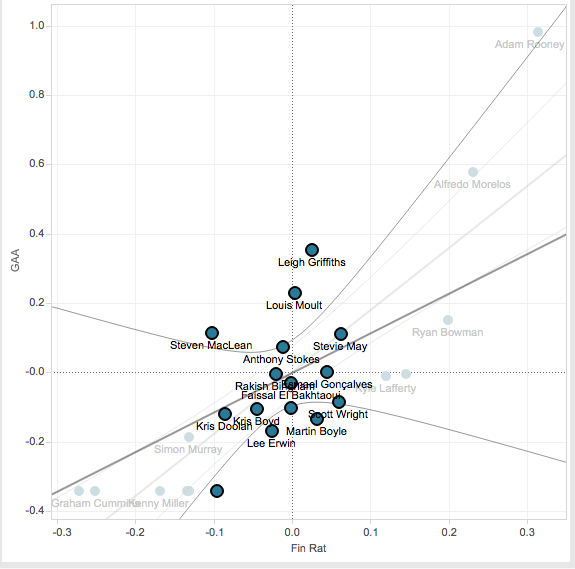 Let’s finish by focusing on one outlier in particular, Alfredo Morelos. The Colombian forward who tore up the Finnish league with absurd scoring rates, is now doing the same in Scotland. He averages nearly a goal per 90 (0.92 goals per 90) & his GAA is by far the highest in relation to the next best forward Leigh Griffiths. 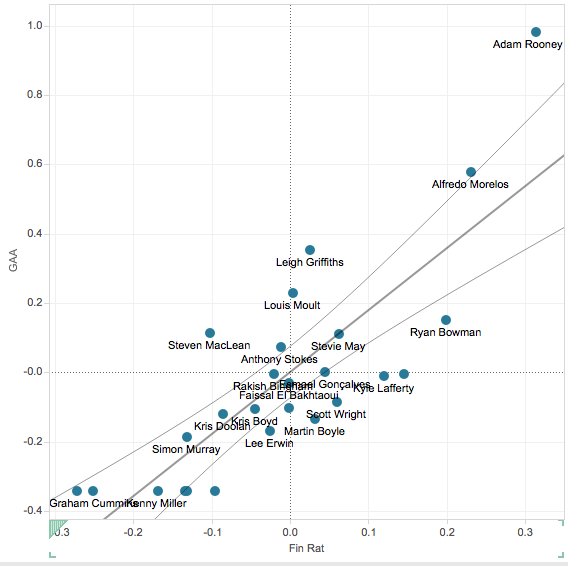 Note: I have a giant asterisk on Adam Rooney’s rate given the hat trick in the last match he played. He has only played 204 minutes & normally wouldn’t be included with those low minutes but the graph was only based on the number of shots taken. Back to Morelos, he also has a Finishing Rating that is far beyond anyone else in the league (+0.23). His Expected Conversion Rate is 23% (the 6th highest in the group) & his actual Fenwick Adjusted Conversion Rate is 46%! He has doubled up on the number of goals his xG suggests that he should have. I’m still not sure what to make of this. Normally, I’d say “Look out for a scoring drought”, but over his past two seasons in Finland his Goals Above Average for that league was 0.70 & 0.29 (as a 19-year old) & this season it’s 0.58. Even at this lowest rate as a teenager, it was nearly on par with what Leigh Griffiths is doing this season. This seems to flag a player that is trying to find the appropriate level for his talents. He was too good for Finnish football & even though it’s still very early, the initial indicators is that he may just be too good for Scottish football as well. The Expected Conversion Rate stat was inspired by a similar stat developed by Emmanuel Perry who runs the Corsica hockey stats site. Pingback: Which top scorers are due to see the goals dry up?